Cisticolas (pronounced sis-TIC-olas) are a genus of very small insectivorous birds formerly classified in the Old World warbler family Sylviidae, but now usually considered to be in the separate family Cisticolidae, along with other southern warbler genera. 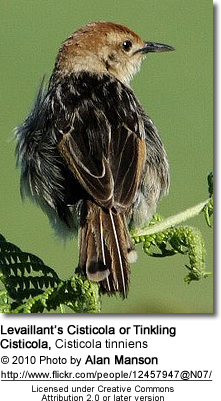 They are believed to be quite closely related to the swallows and martins, the bulbuls and the white-eyes. The genus contains about 45 species, of which only two are not found in Africa: one in Madagascar and the other from Asia to Australasia. Their generic name, Cisticola, means inhabitant (-cola) of a woven basket (cista-), referring to the finely woven nest of the Zitting Cisticola, the most widespread species. They are also sometimes called fantail-warblers due to their habit of conspicuously flicking their tails, or tailor-birds because of their nests. Cisticolas are widespread through the Old World's tropical and sub-tropical regions. Africa, which is home to almost all species, is the most likely ancestral home of the group. 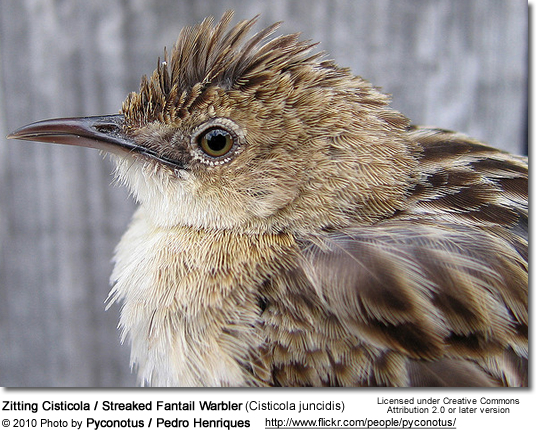 Cisticolas are usually non-migratory with most species attached to and often distinguishable by their habitats. A variety of open habitats are occupied. These include wetlands, moist or drier grasslands, open or rocky mountain slopes, and human-modified habitats such as road verges, cultivation, weedy areas or pasture. The species preferring wetlands can be found at the edges of mangrove, or in papyrus, common reed, or typha swamps. Cisticolas are generally quite common within what remains of their preferred habitats. 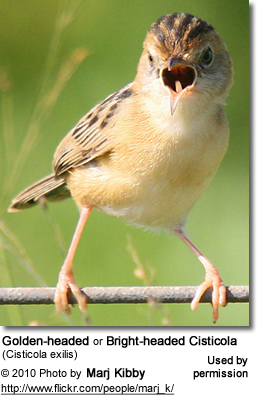 The Zitting Cisticola (or Fan-tailed Warbler) is widespread throughout the tropics and even breeds in southern Europe. It has occurred on a few occasions as a vagrant to England. Because of their small size (about 10 cm) and brown plumage, they are more easily heard than seen. The similar plumage of many species can make them hard to identify, particularly in winter when they seldom emerge from their grasses. Many African species, in particular, are difficult to distinguish other than by their calls. Thirteen species are named for their calls, from "Singing" and "Chirping" to "Bubbling" and "Siffling". 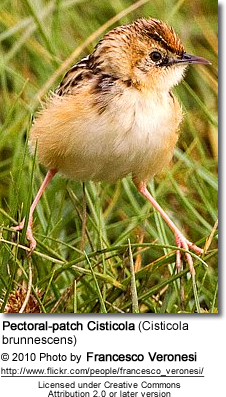 Male cisticolas are polygamous. The female builds a discreet nest deep in the grasses, often binding living leaves into the soft fabric of felted plant down, cobweb, and grass: a cup shape for the Zitting Cisticola with a canopy of tied-together leaves or grasses overhead for camouflage, a full dome for the Golden-headed Cisticola. The average clutch is about 4 eggs, which take about 2 weeks to hatch. The Parasitic Weaver is a specialist parasite of cisticolas and prinias. In summer, male cisticolas of smaller species make spectacular display flights while larger species perch in prominent places to sing lustily. Despite his size and well-camouflaged, brown-streaked plumage, the male Golden-headed Cisticola of Australia and southern Asia produces a small, brilliant splash of golden-yellow colour in the dappled sunlight of a reed bed. Nguembock B.; Fjeldsa J.; Tillier A.; Pasquet E. (2007): A phylogeny for the Cisticolidae (Aves: Passeriformes) based on nuclear and mitochondrial DNA sequence data, and a re-interpretation of a unique nest-building specialization. Molecular Phylogenetics and Evolution 42: 272-286.